As the City of San Diego’s Street Division was threatening to chop down the Torrey Pine, local activists and this website obtained an agreement from the City that they would not touch the tree until they could prove to the community that there was nothing else to do but remove this municipally-protected tree. It was the continuing saga of saving the Torrey Pine at 4633 Long Branch. I’ve been describing this saga in Part One – a more in general look at the uniqueness and threatened status of the Torrey Pines, and in Part Two – the nitty gritty detailed development of the City’s plans to chop down the tree and the community’s response up to the time of the Planning Board meeting. 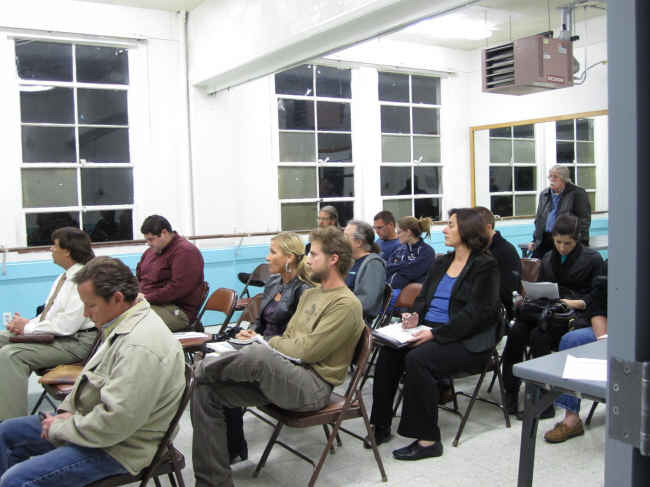 The audience at Planning Board meeting. By time the meeting really got going, I counted 25 people in the audience, and in front of us – by time they all arrived – were the thirteen Board members, with the Chair Giovanni Ingolia squarely in the middle. Mary Wolford, project manager for the Street Division, got up to speak. As I understand it, she has the final say whether the tree stays or goes. She spoke about the complaint about the tree “leaning” and the adjacent cracked sidewalk and its temporary repair. There had been no money for a permanent repair a few years ago, she said, so it was added to a list. Now, money has been identified to fix the sidewalk, and – more complaints have come in. So, the tree’s status was handed over to a City tree expert, Micah Millet, who stated that the tree was not unstable. Wolford said she expected the sidewalk repair contract to go out in January, and then the repair done in March. And her position was that night, that the tree had to be removed. The sidewalk has buckled and cracked, is a hazard and everybody knows the City is liable. So, in a very real sense, the sidewalk repair drives this whole thing. The sidewalk has to be repaired – everybody agrees to that. Yet City experts say that when the sidewalk is repaired, the roots – and hence the tree – will be damaged, then weakened, and then a hazard, and must come down. Wolford was asking, ‘did the tree move?’ during this recent storm. She recounted the unknown citizen story, the citizen who told the Street Division guys that the tree had moved during the most recent storm. This story has been raised several times. And she hinted that winter storms could still come in and weaken the Torrey Pine – with the definite implication that it would have to be cut down. Wolford finished up, creating a segue for Drew Potocki, the City’s urban forester, by saying that the City wanted yet another opinion about the tree, so they brought Potocki in for a second opinion. Drew got up, and in his down-home, folksy manner, made a case for the Torrey Pine’s removal. He laid out an argument that since the experts say it must go, it must go. He said they had received more opinions from arborists about the tree, and they all say it’s a hazard and has to be removed. Thyme Curtis of Councilmember Kevin Faulconer's office. Curtis has been in the loop on this issue from day one. Wow, I thought, Potocki has changed his mind. Where was the north-side foliage trimming that he told me about? When Drew Potocki and I first discussed this tree and came to an agreement to come to the Planning Board, he told me that he thought the tree could be saved but by drastic foliage trimming – especially on the tree’s north side – the side where the tree towers over the narrow street below. He had given me this position of his, I repeated it in a post on November 11th, and that was a little more than two weeks before the Board meeting. Now he was recommending complete removal – or complete chopping down. Complete cutting up. Potocki was still speaking. He referred to other reports that he had received about the tree. 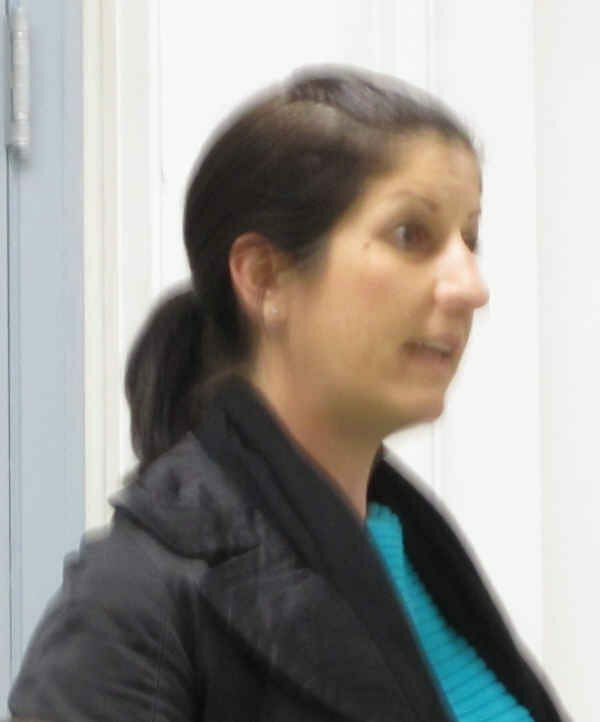 There was the report from the Area Manager of West Coast Arborists, a certified arborist – who recommended its removal. West Coast Arborists are the contractors that the City hires to trim and remove trees, and they were the folks who “trimmed” the Torrey Pines over on Saratoga just a week or so before the meeting. One Board member referred to that trim job as “barbaric,” or words to that effect. Another expert was quoted by Potocki as calling for removal – this time it was an emergency response guy, Gary Foulkes. 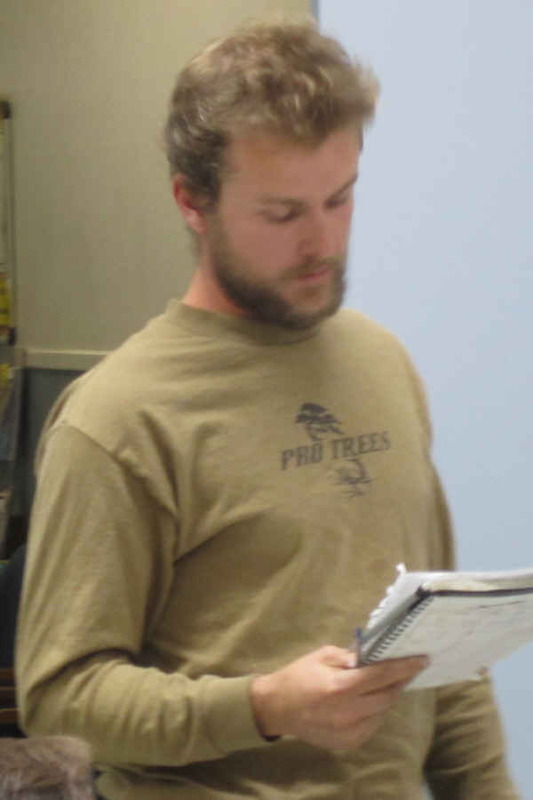 And another arborist Tim Jones was also cited calling for removal. While he was talking, Potocki kept referring to the reports he had handled in to the Planning Board. He had handed in a packet, with a two-page section entitled “Requested Opinions”, but not to the public. It wasn’t until after the meeting did we get a chance to see it. 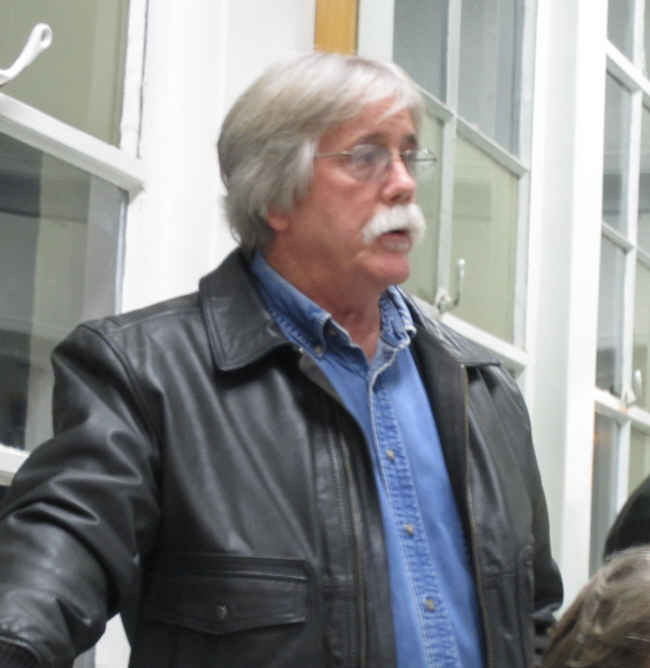 Tree activist Richard Agee had filed a Public Records Request seeking these very reports. He has yet to receive them. But that night, Potocki was handing out his report with supposed quotes from the other specialists. Now, this section 63 is part of the same section of the Muni Code that contains the section that states that Torrey Pines are protected. However, a closer look at the section that he cited, shows that it is not the panacea that Potocki claimed. First, it refers to “any employee of the Park and Recreation Department” – well, neither he nor Mary Wolford are employees of that department, so that clause of the section does not apply to them. Second, the Park and Rec employee is not prevented from doing anything “that in the opinion of the City Manager” – we no longer have a “City Manager” but we do have a “strong mayor” – “or” it says “of the Park and Recreation Director may be thought necessary and proper for the maintenance, improvement or betterment of said beach area.” I am not aware of any Park and Rec Department employee involved in this controversy. 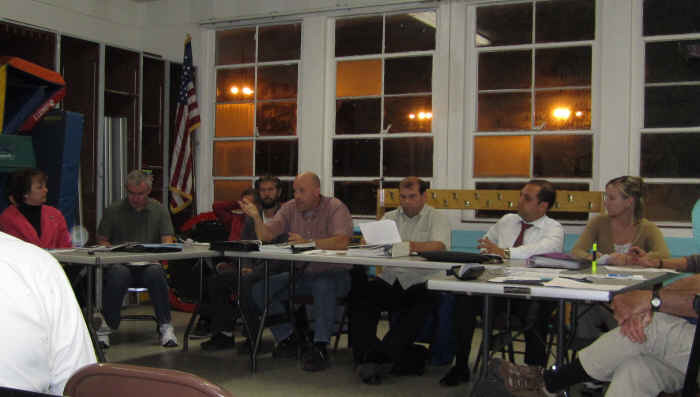 The Park and Rec Director has not weighed in, plus Potocki is of the City’s Engineering and Capital Projects Department, and Wolford is of the General Services Department / Street Division. The other clause that may be appropriate applies to “any employee or agent” of the City – which Potocki and Wolford certainly are – BUT – the clause continues “in the opinion of The City Council” – stop right there. The City Council has not weighed in on this. So, from a cursory look at this Municipal Code section that Potocki cites as his and Wolford’s authority to chop down the Torrey Pine – actually does not apply to this tree. Meanwhile, back at the Board meeting, Potocki was winding down. The tree is so heavy over the roadway, he said, that it had to come down. Then he began one of the most ludicrous parts of his long-winded spiel. After the City chops down the Torrey Pine, he said, the community could use its wood as keep-sakes or as decorations for fundraising. I couldn’t believe my ears. He was actually saying that. Sure, chop down a sacred, memorable, majestic and protected Torrey Pine and use its wood as fodder for our memories. Incredible. Finally, the Board entertained questions from the audience. A couple people who live on the block in question wanted it removed. But they gave their opinions before the “other side” had spoken. One man – who lives directly across from the tree – changed his stance after he had heard from tree proponents. One guy who lives on the 4600 block of Saratoga – where the City worked with local residents to save their Torrey Pines – said they are native, should be saved, and trimmed. Then Pat Flannery – a civic activist and blogger – questioned how the outfit that chops and trims trees for the City – West Coast Arborists – could be cited as an independent opinion as they are paid by the City in bulk for tree removals. Then Theron Winsby got up. He was a second generation certified arborist that had been retained by local activists and asked to do an evaluation. He said he did an visual inspection of the tree and found that it was healthy, and had possibly large roots that anchored the tree on its south side. He acknowledged that the limbs are heavy. But, he had many questions, he said, that needed to be answered before the tree was destroyed. Number one, Winsby said, was “Why is the tree leaning?” Is it leaning he asked, or growing at a slant? He added it has bended to the prevailing winds in the area. He said that many Torrey Pine trees grow at a slant, and that he had photos to prove that point. (We later got hold of those photos and posted them in a recent gallery.) Winsby ended by saying that he needs to perform a root collar inspection. 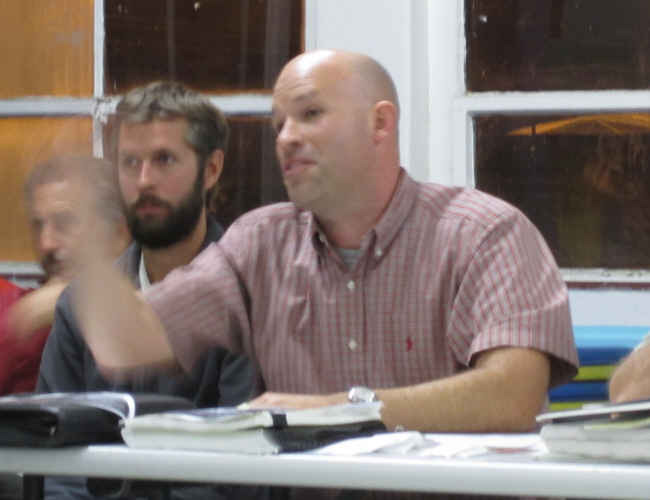 I was next to speak, and my points were that that Potocki had told me he had the opinions of “three independent arborists” – but that those he cited that night were not “independent” at all -that they all worked for the City. Plus, I said, the sidewalk could be repaired without damaging the tree’s roots or endangering the tree itself so it didn’t have to be removed, and that the Board should hold off on any vote to allow citizens and our experts time to give a presentation. Torrey Pine expert David Shaw believes the Long Branch Torrey Pine is "an incredibly healthy tree." Next audience member to speak was David Shaw. He too was a Torrey Pines expert and was affiliated with the University of California. He had looked at the tree the day before, and he said, “it is an incredibly healthy tree.” It had no insects, he said, it’s not damaged, has no diseases, has no mites. It’s old wounds had healed well, and that it was in “pretty good shape,” and that it had a tremendous canopy. He repeated the idea of Winsby, that the tree needs a root collar inspection. This is done, he said, by peeling back the cement of the sidewalk, and use a hose to wash away some of the soil to locate the roots. Finally Shaw iterated that there’s new things done with sidewalks these days, and there’s lots of alternatives to sawing through the roots in order to lay down a new cement sidewalk. Once Shaw was done, Geoff Page got up and added his support to save the tree. He described how he had been part of efforts to save a giant pine tree at the corner of Sunset Cliffs Boulevard and Del Monte Avenue many years ago, but had lost. Page said, “the sidewalk issue is not an issue,” repeating the point that the sidewalk could be repaired without hurting the tree or its roots. Geoff Page wanted to know of the 400 trees that fell recently in San Diego were Torrey Pines. Page then responded to one of the things that Potocki had said. Potocki had earlier claimed that 400 trees had fallen down over the recent past within San Diego. Page said that he bet 395 of those trees were Eucalyptus trees or palm trees. He asked Potocki for a detailed list of the types of trees that had fallen, and specifically he asked, “How many Torrey Pines have fallen over?” There had been one a number of years ago during the Nineties whose limb had fallen and the tree was found to have root rot. The City had no answers to these questions. Finally, the Board members themselves asked questions and made comments. Scott Waschitz, one of the Board members who represents District 3 – where the tree sits – cited a general theme of safety. He said he was familiar with other cities and how they dealt with trees. Monterey, for example, he said, anchored trees, roads were built around trees, sidewalks are curved around them. Every time a Board member had a comment or question, Potocki jumped in – and he got a lot of play time this way. Deep into one of his arguments, he played the “fear” card, saying that the tree was a hazard, that it might fall anytime, falling on children, adults, and homes in the way, and then citing fears that a school bus could drive down the street and hit the tree. If logic doesn’t do it, fear will. Scott Waschitz, Barbara Schmidtknecht listen to Seth Connolly. Craig Klein and Scott Therkalsen are to Connolly's left. Craig Klein asked the question, ‘are there ways less drastic than cutting it out?’. He believed the tree could be pruned tastefully to equal out the weight, and pruned enough to make the house across the street safe. “It does not need to look ‘funny'”, he said. 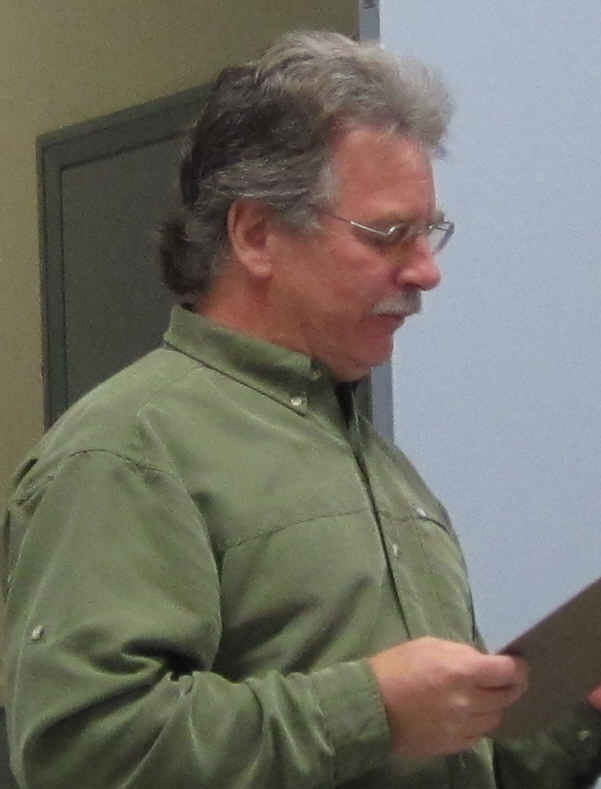 Scott Therkalsen, a new Board member, complained that the packet from Drew Potocki given the Board had only been handed out three hours before the meeting. He asked that in the future, the Board be notified with plenty of time to study the documents given them. Landry Watson gestures while he speaks. Scott Therkalsen and Craig Klein listen. The Vice-chair of the Board, Landry Watson, added that the tree is not an immediate danger. Potocki had said that the tree needs to be removed before the next Winter storm. If the sidewalk is not repaired, the tree should still be removed within 30 days. Watson asked how much a root analysis costs, and whether that is typical for the City to do on trees. The amounts of $2000 to $2500 to do such a study were bandied about. It was at this point that Potocki chimed in with even another reason/ issue that the tree needs to be removed. The tree was encroaching into the public right-of-way, and that this reason alone was sufficient for its removal. His point was that the tree’s lean or slant was too far into the roadway, and that vehicles going down Long Branch could possibly run into the trunk and cause it to fall. Board member Jane Gawronski who has a PhD in public education asked the folks in the audience who said they lived directly across from the tree and who wanted – at least initially – to have it removed – whether they had any problems with their homeowners’ insurance when they purchased their house. They answered that they had bought the house two years ago, and that no, no problems with insurance. Jane asked, “What would it take to make the tree safe?” The City had obviously made the Torrey Pines on Saratoga safe and they were maintained by the City. Scott Thekalsen, Vice-chair Landry Watson, and Chair Giovanni Ingolia. Board Chair Giovanni Ingolia spoke next. He said the Torrey Pine was cited as “endangered” by international groups that look after trees. He acknowledged that the sidewalk is not ADA compliant. But he asked, if the tree was so dangerous, why hadn’t the City done things to prevent people from parking under it? Then Ingolia raised the issue of fundraising or seeking donations for a root analysis. He added that he thought more research was needed, a root demonstration at the least. The Board went into more discussion. Watson said the Board should not take any action that night, that the Board could have a special meeting, that the sidewalk should be pulled up and the roots evaluated. He also added that the Board did not have enough time to sufficiently review the material given them, that there needs to be another meeting on this issue, and thanked those who had brought the issue to the Board. Connolly added that there was no immediate hazard, that the tree is a liability issue, but that the City would not have on its own brought the tree issue to the Board. Barbara Schmidtknecht thought there should be more time given to evaluate the tree. Ingolia reiterated that it would be nice if they had a root analysis, and that it should tabled for a special meeting in January. At this point, Potocki did say that the activists’ expert could trim the tree without a permit if the Street Division could let him. 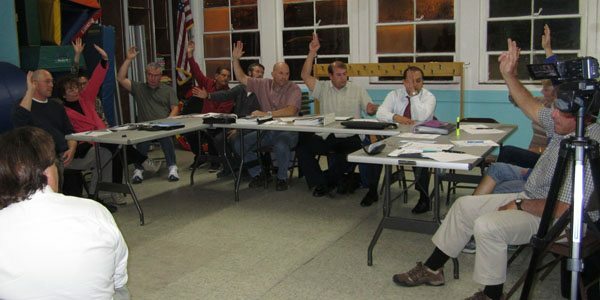 Board members then wanted to resolve the issue this evening with some kind of vote. Usually, the Board allows the Rep of the district where the building or issue takes place to make a motion. Everyone looked at Bill Bushe. Bushe stepped back from his “take it down now” position and made a motion to continue the matter for thirty days to allow the parties to make their studies and to pursue alternatives, and return to the Board in January. The vote to put off any decision until the next meeting is unanimous. This motion passed unanimously. There was some applause – and most of the audience in the room got up to leave. Chair Ingolia nearly had to yell out that they wanted full reports by next month. And thus ended another small chapter in the story of how the Torrey Pine tree on Long Branch is saved or not saved. As always….thank you for keeping OB informed. Faulconer has a pile of discretionary money …is he will to allocate some for the root analysis? On a similar note, has anyone in the city walked OB and identified any other potential tree(s) that may be a concern or hazard? It so, they should bring this list to the OB Planning Board for review. If not, they should put it on their list of things to do in order to be proactive not reactive. 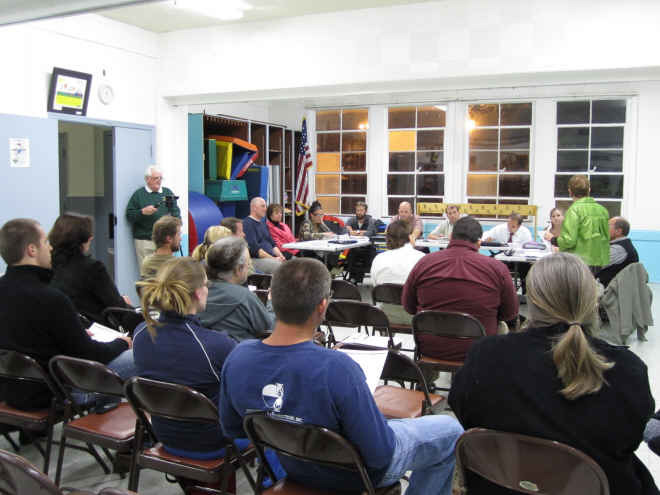 Save a healthy Torrey Pine – Come to tonight’s Planning Board meeting.